A Scottish Renewables Developer has revealed that by 2020, proposed wind farm projects in Scotland have the potential to inject £2billion into struggling rural economies and supply £50million of funding to help people into work, training and further education. 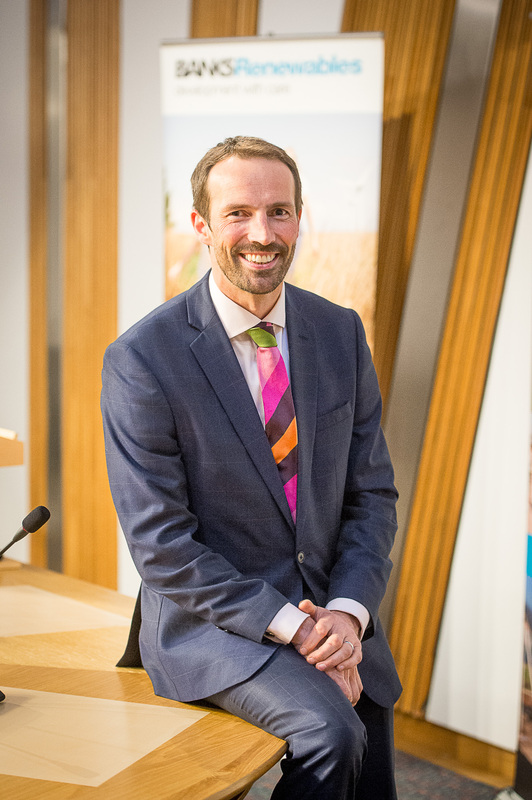 Speaking at a parliamentary reception to discuss the future of renewable projects in Scotland, Colin Anderson, Development Director of Banks Renewables, outlined an approach to wind farm projects that ensures the greatest benefit to the communities that house the projects, helping to regenerate many struggling communities throughout the country. The Connect2Renewables event, hosted by Christina McKelvie MSP, also saw politicians from across the political divide, fight the corner for onshore wind in Scotland, claiming that the UK Government stance undermines the importance of the industry to communities, the Scottish economy and the many thousands employed by it. The reception took place as employers group, the CBI, spoke out on the government cuts to renewable energy subsidies, saying they were sending a worrying sign to investors. Mr Anderson agreed and claimed it was nothing short of perverse that when the UK has a clear legal commitment to decarbonise its economy the UK Government is choosing to rule out using the cheapest renewable energy technology, onshore wind, and so will cost the UK consumer billions in higher energy bills in the future. In November 2014, Banks Renewables launched the Connect2Renewables charter inpartnership with South Lanarkshire Council, committing a minimum of £69 million to the local economy and communities in the area, prioritising local firms in the supply chain and supporting around 457 local unemployed people back into work, training or further education. Now, the Hamilton based employer has committed to adopting this approach to all its future renewable projects across Scotland. Mr Anderson said: “If the Connect2Renewables approach was to be adopted by all developers in Scotland on the estimated 4GW of good onshore projects, not already under construction, and deliverable by 2020, the potential benefits to communities and local employers are staggering, injecting an estimated £2billion into struggling rural economies and supplying £50million of funding to help people into work, training and further education. Christina McKelvie SNP MSP for Hamilton, Larkhall and Stonehouse, was quick to back the Connect2Renewables approach, claiming it also has many indirect benefits for the local communities hosting wind farms. She said: “Colin and his team at Banks have an excellent record of community engagement and involvement, so it’s no surprise that we find ourselves here tonight hearing about Connect2Renewables and the ambition it has for building and sustaining communities, building infrastructure, creating clean green energy and the best of all, creating jobs for local people. “(In South Lanarkshire) Connect2Renewables will give a minimum of £69 million of local economic benefits for the area. It will give us a £1.74 million jobs and training fund that will support 400 plus local unemployed people into work, provide further education or workplace training – by breaking down the financial barriers that may be holding people back. “It will directly support around 224 jobs during construction and around 20 jobs once the projects are operational; it will also support a local supply chain that employs thousands of people. South Lanarkshire Councillor, Chris Thompson, Chair of the Enterprise Services Committee, agreed adding: “Connect2Reneables ticks all the boxes for what we are trying to do to help the economy and communities in South Lanarkshire. This summer the UK government cut subsidies to onshore wind projects because the £7.6bn budget had been exceeded, which led to John Cridland, head of the CBI stating this week that firms must be given confidence that ministers really mean to tackle climate change. Colin Anderson, said: “It seems perverse that at time when there is huge uncertainty about our energy future and how we can hit our legal commitments to decarbonise our economy in a cost effective way, that the UK Government is turning its back on a readily available source of low cost energy from a proven and reliable technology – onshore wind! “Opponents of onshore wind often suggest that it is inefficient, costs us money and people don’t want it – however the facts clearly state otherwise. “Repeated government surveys show upwards of 60 per cent support with a consistent 20-25 per cent against. Onshore wind is the cheapest form of renewable energy, with costs still decreasing. “Further to this, as an industry, following the first round auction for Government electricity contracts under the new CfD regime, we have already reached a price level that the cross party Committee for Climate Change has reported should not be considered a subsidy. This has taken away any argument on cost – and costs are still decreasing! Banks Renewables is part of the Banks Group (www.banksgroup.co.uk), a family firm founded in 1976, which now employs more than 420 people in the renewable energy, property and mining sectors. WANT AWARD WINNING PR FOR YOUR BUSINESS? Are you interested in award winning PR like this for your business? Get in contact with us via 0131 561 2244 or fill out a contact from below.